Dr Todung Mulya Lubis is one of Indonesia's leading human rights lawyers and most influential legal thinkers. He completed his undergraduate Law degree at the University of Indonesia (1974); his LLM at the University of California, Berkeley; a second LLM at Harvard Law School; and his JSD at the University of California, Berkeley. He has been a senior Adjunct Membre of the Faculty of Law, University of Indonesia since 1990, where he was first appointed in 1975. From 1980-1983, he was Director of Indonesia's famous dissident NGO, the Legal Aid Foundation, where he worked for many years. His influential 1983 scholarly book In Search of Human Rights: Legal-Political Dilemmas of Indonesia's New Order 19661990 played an important role in defining democratic thinking about human rights in Indonesia. 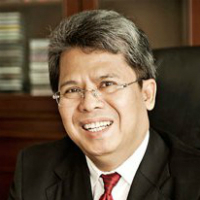 Dr Lubis is also Founding and Senior Partner of a prominent law firm in Jakarta and has been lead counsel in a number of major human rights cases, often on a pro bono basis. These include acting for the Bali Nine in an attempt to convince Indonesia's Constitutional Court to abolish the death sentence and against President Soeharto. He has also held a series of senior government appointments. In 2014, he was appointed as Honorary Professor at the Melbourne Law School, The University of Melbourne.